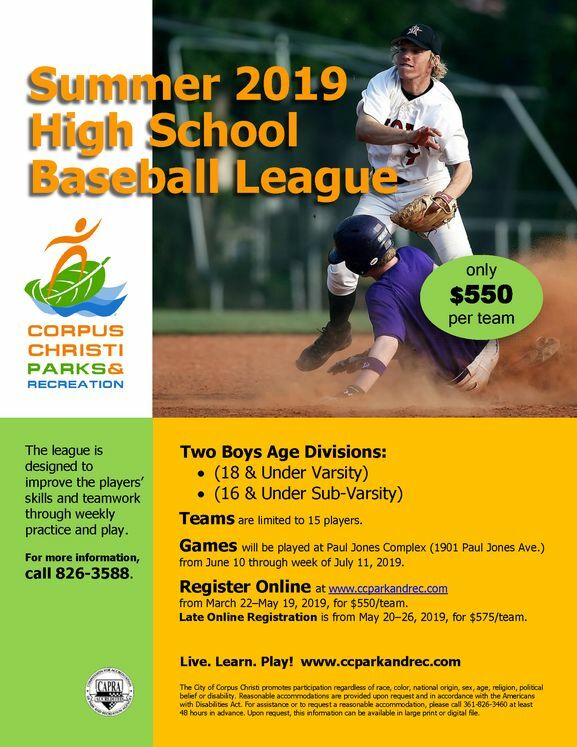 CORPUS CHRISTI, TX – The Corpus Christi Parks & Recreation Department will offer its Summer 2019 High School Baseball League from June 10th through the week of July 11th. This is a team concept league that is limited to 15 players per team. Two boy divisions are eligible to participate; (18 & Under Varsity Division) and (16 & Under Sub Varsity Division). Participants will obtain a full understanding and importance of the rules and the concept of teamwork. While this program provides structure and knowledge of the sport of baseball, it also promotes positive attitudes and the importance of adapting a lifestyle with recreational activities. REGISTER ONLINE at www.ccparkandrec.com now through May 19th, for $550/team. LATE ONLINE REGISTRATION will be held from May 20th – 26th for $575/team. For more information, call the Athletics Office at 361-826-3588 or visit www.ccparkandrec.com (SPORTS).